» What’s New What’s New | Cape Banks Family History Society Inc. It is perhaps one of greatest truisms of family history research that we will often find that the lives of our ancestors were best documented when the chips were truly down. There were many battles that our forebears fought for and against in Scotland, both on a personal level and a part of the society within which they lived. There were the laws of the local parish church and the punishments awaiting those who breached kirk discipline; the struggles to avoid poverty and the stigma of being a debtor; the darkest moments of the soul, from mental health issues and illness, to murder and suicide; and the dramatic moments of rebellion, when our forebears drew a line in the sand against a perceived tyranny or democratic deficit. Illness, death, bigamy, abandonment, accidents, eviction, ethnic cleansing – a dramatic range of challenges across a lifetime, and at times, outright tragedy. And close to each of them, a quill and ink. But through all of these episodes, there is an even greater story that emerges, of how our ancestors overcame such struggles. 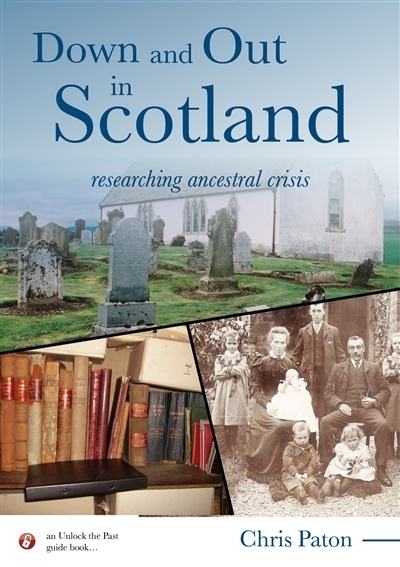 In this Unlock the Past guide, genealogist Chris Paton goes in search of the records of ancestral hardship in Scotland, to allow us to truly understand the situations that our ancestors had to endure and overcome across the generations, to hep us become the very people who we are today. 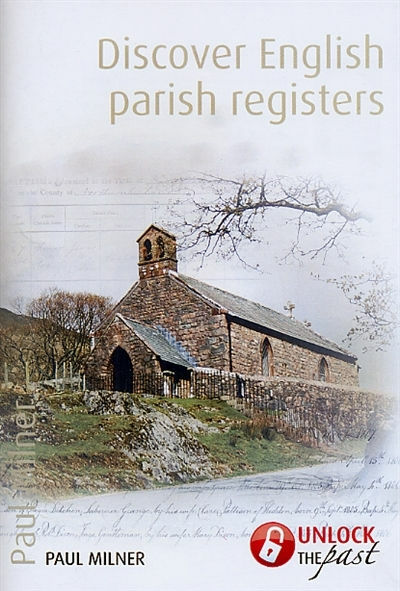 In this greatly expanded second edition of Chris Paton’s popular title, he explores the history and records of the various churches in Scotland prior to 1855, the year in which civil registration commenced within the country. He describes the theological changes imposed by the Reformation of 1560, the nature of the state’s battles with the Kirk, and the Kirk’s subsequent battles within itself. 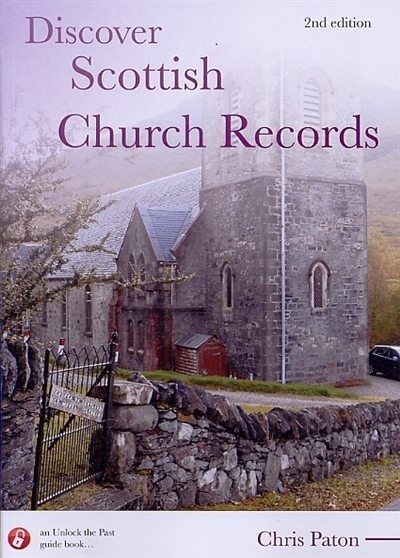 Most importantly, he also discusses the nature of the records generated by the various Scottish churches, how to interpret them, and above all else, how to find them. 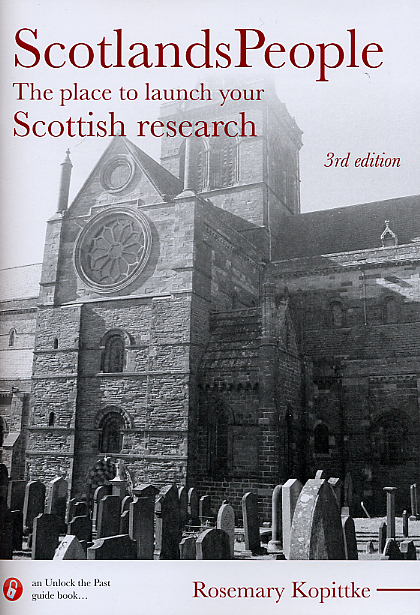 Whether you are looking for tales of ministers carried into the air by Scotland’s fairy folk, the fire and thunder of John Knox, a detailed explanation of the online offerings of the ScotlandsPeople website, or the treasures waiting in the National Records of Scotland, this is the definitive research guide to help anyone with Caledonian connections. This guide from family historian Chris Paton takes a look at the vast world of Scottish civil registration records. Scotland commenced the statutory registration of births, marriages and deaths within the country in 1855, some seventeen and half years after a similar process had already got underway in England and Wales. 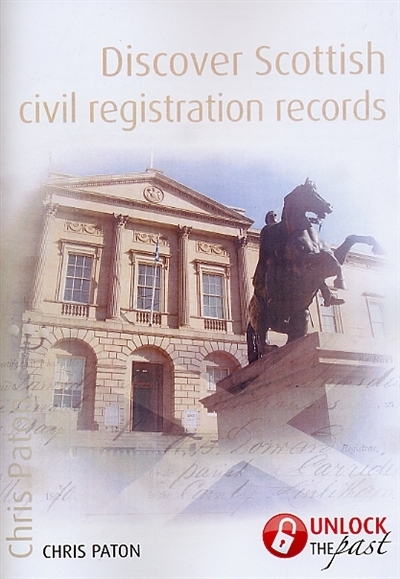 ScotlandsPeople provides an exceptional source of genealogical records for those with Scottish ancestry – Statutory registers of birth, death, marriage, divorce, civil partnerships and dissolutions; church registers for the Church of Scotland, the Roman Catholic Church and other Presbyterian churches; census records; valuation rolls; and legal records covering wills and testaments, soldiers’ and airmen’s wills, military service tribunal appeals, and Coats of Arms. Access to such a wide range of basic records for a relatively cheap fee means we can all research from our home without the expense of hiring a search agent, ordering in many microfilms, or a trip to Scotland – as pleasant as that last option may be. With some knowledge and practice you will become adept at locating records of relevance to your family and you will be well on your way with your research. Of course, not all records are available online. You will still need to track down your non-conformists, investigate land records, maps, cemeteries, electoral rolls, directories, poor law, military and other records, but ScotlandsPeople is a great place to launch the study of your families. This book guides you through finding various records which will help in locating your ancestor’s place of origin. ‘Researching in German civil and church records’ answers the question ‘How can I obtain a birth or marriage certificate from Germany for an immigrant ancestor?’ What the new researcher may not realise is that in Germany the system of births, marriage and deaths by civil authorities, and the issue of associated certificates, has some significant differences to the system that the researcher may be used to. 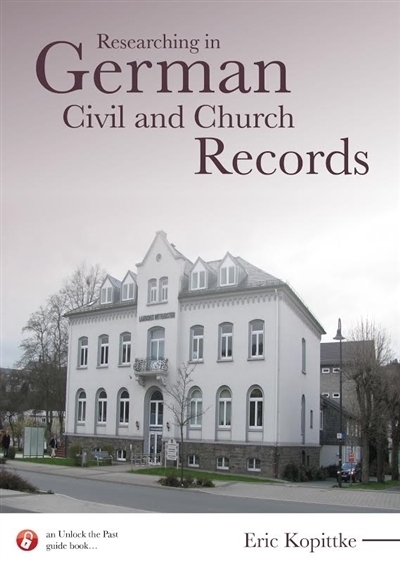 This book is a practical guide that, with the aid of many illustrations, will allow the reader to become familiar with the types of information available on German civil certificates of birth, marriage and death and church records of baptism, marriage and burial. 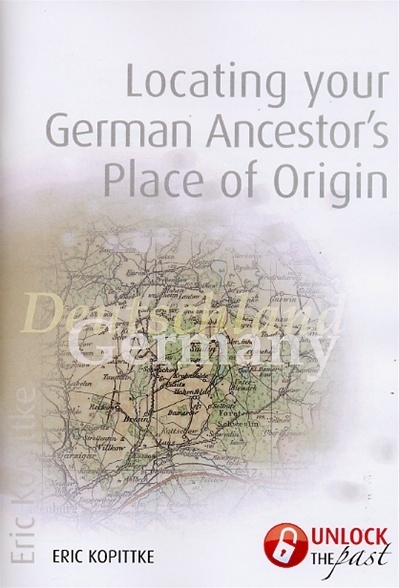 The book then explains how to access these records and build on the information given in the companion volume ‘Locating your German ancestor’s place of origin’. The author’s interest in asylum records was sparked when she found some of her own ancestors had spent time in asylums, or had died in an asylum. Asylums were not only used to house the poor, the aged, the frail and those who had no one to care for them. Surviving archival records provide a wealth of genealogical information not usually found in government records including information on patients’ physical description, personal family details, health information and sometimes even a photograph. As well as archival records, information can also be found in newspapers, published histories, government publications and enquiries. 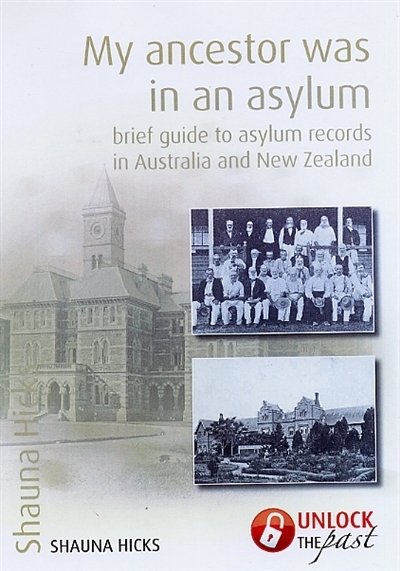 Libraries often have photographs of asylum buildings, grounds, wards, patients and staff. If you have lost an ancestor, or simply misplaced them for a few years, then asylum records may be worth investigating. This brief guide in an excellent introduction to resources available and how to use these resources effectively. Do asylums hold the key to bringing down your brick wall? Why not find out now! 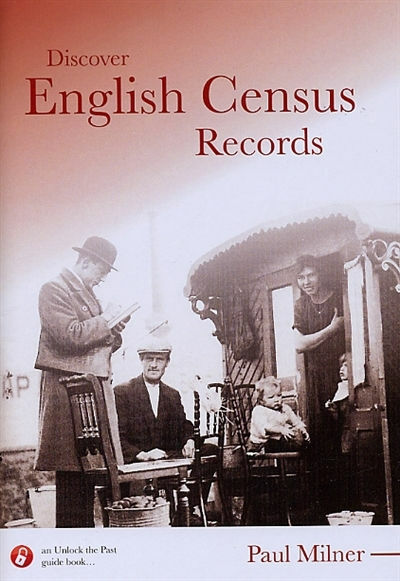 English census records are a fundamental source for English research, because it is the only source that clearly identifies all the members of a family unit in one records and puts them all together in the one place at one time. In this detailed guide, family historian Paul Milner explains how and why census records were created in 1801, expanding to an every-name format in 1841, and following every 10 years since. The book explains what the records look like, how they have evolved, and why they are one of the few records that place individuals into families. By following a case study family through the different census years, Milner expands upon census records to show how to put the family physically on the ground, using maps. Census research methods have changed drastically in the last few years, as nationwide indexes have come online, others with attached images. This book also shows how to effectively use these different online databases and indexes. 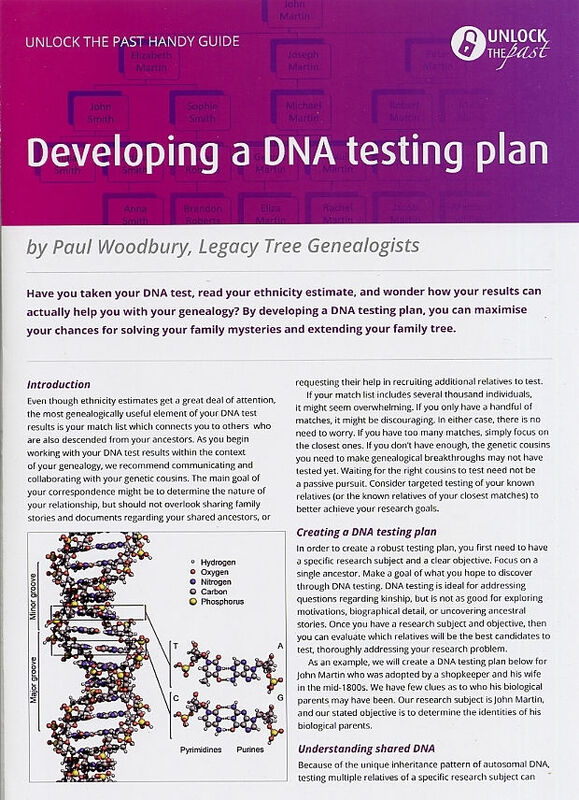 Here is a practical guide that not only will help the beginner avoid mistakes in climbing the family tree, but also provides depth and details to assist the experience researcher. English parish records are a fundamental source for English research. In this detailed guide, family historian Paul Milner explains how and why the records were created, beginning in 1538, what the records look like and what information they contain. A well-illustrated case study, with plenty of twists and turns, shows why care is needed to trace back in time from one generation to the next. The guide continues by explaining how and where to get access the records, (online, microfilm, originals or in print) and concludes by explaining what to do when you can’t find your ancestors in the records. The questions that drive us with family history research in Ireland are no different to those asked anywhere else in the world. We need to find the records that tell us who our ancestors were, when and where they lived, and how they related to others. In Ireland, however, many of the records necessary for the task have sadly been lost across time, of were woefully restrictive in how they were created in the first place. 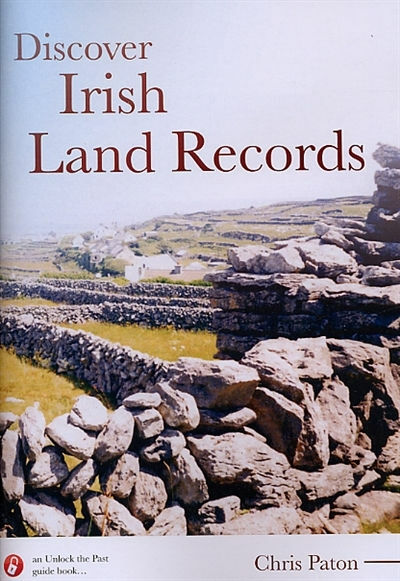 Whilst some of the basic vital records do not survive, however, there are plenty of others that will compensate, in this guide book, Northern Ireland born family historian Chris Paton takes a look at the potential to be found within Irish land records. Amongst documents of ownership and tenancy, valuation and tithes records, documents for inheritance, censuses, and many other resources, there are ancestral stories lying dormant and waiting to be found. In this guide, he demonstrates how to find them. 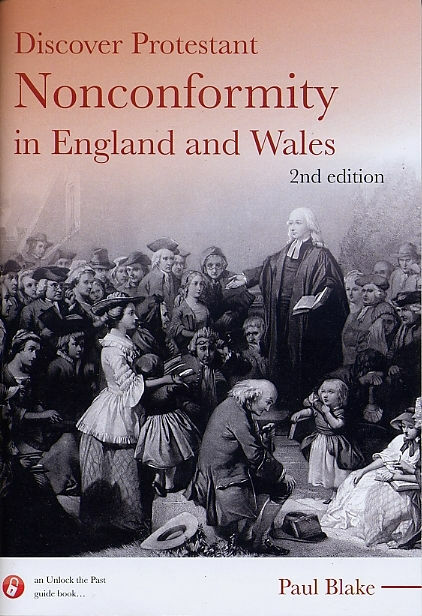 The aim of this book is to introduce researchers to Protestant nonconformity in England and Wales – whether they’re family or local historians, or others who have a general interest in the subject. Not all our ancestors were Church of England, of even Catholic. A fair number, particularly after the start of the eighteenth century, joined other denominations such as Baptists, Congregationalists or Methodists. Although the State at various periods did its best to eradicate Catholicism and all forms of Protestant nonconformity, particularly during the late-sixteenth and seventeenth centuries, large numbers persisted in their thinking and were persecuted for their beliefs. Therefore, it is quite usual, almost expected, for those researching their family in England and Wales to find it includes religious dissenters. Identifying these folk is not always straightforward: they may have continued to use the local parish church for their baptisms, marriages and burials; and may have belonged to congregations that kept few (if any) records. But there are often clues. Their beliefs, at variance to those of the Anglican Church, may have been short-lived or they may have lasted through many generations and perhaps still persist today. As more and more records relating to protestant nonconformists become available online, the task in discovering more about them is becoming easier. And that trend is sure to continue. Genealogy is one of Australia’s leading hobbies but it can be expensive and time consuming looking for family history information. With the growth of the internet and more records and indexes online it is, however, becoming easier and quicker if you know where to look. 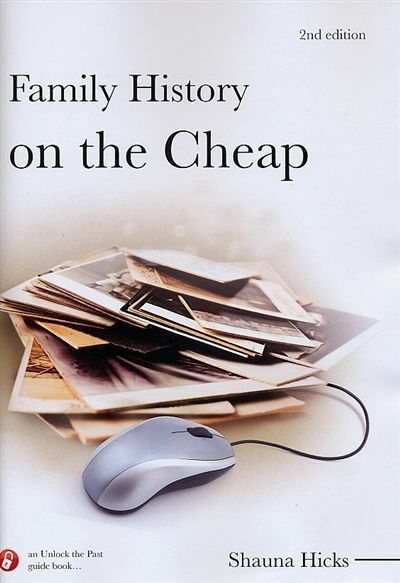 This second, revised and updated edition of ‘Family History on the Cheap’ examines a broad range of topics including family sources, whether someone has already researched the family, when to use professional researchers, how and where to obtain discounts, what sites are free, how to plan and organise your research, making the most of Google, and using social media for family history research. 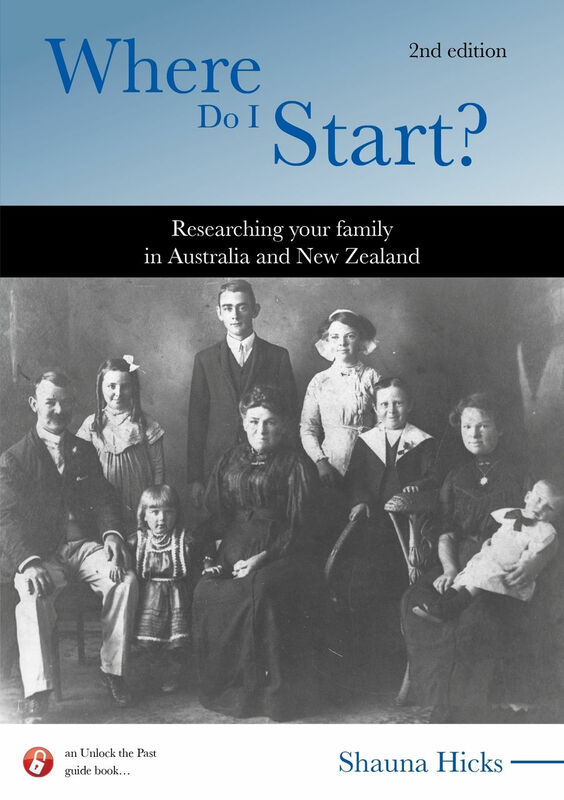 Finding births, marriages and deaths are the cornerstones of family history research and this guide looks at various ways of discovering this information in a wide variety of sources such as wills and probate records, cemetery records and newspapers without spending money. 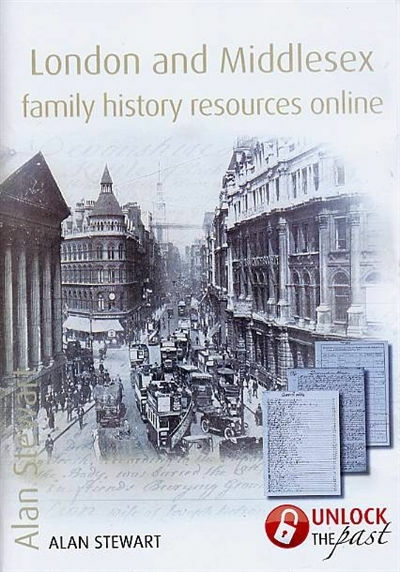 This edition of ‘Family History on the Cheap’ highlights numerous tips and tricks for how to get the most from research trips to archives, libraries, family history and local historical societies, visits to relatives, social networking sites, commercial websites and of course, Google. You will quickly recoup its purchase price many times over with the money and time savings outlined throughout the book. 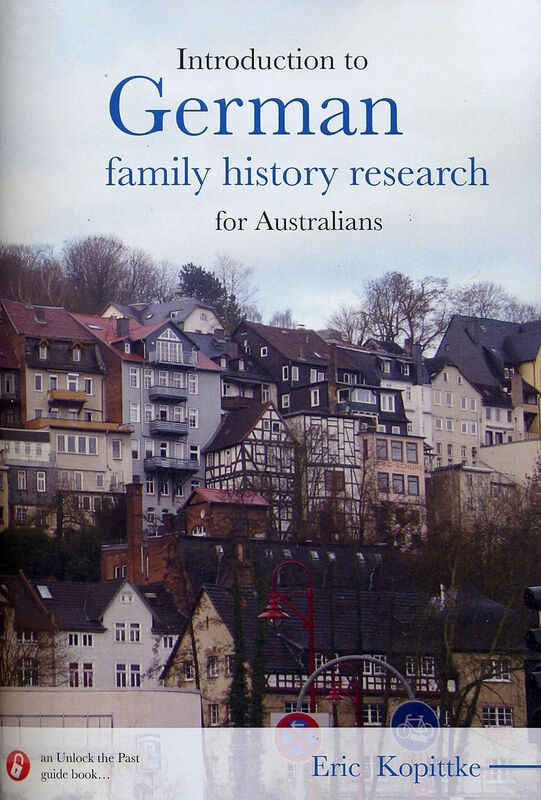 Perhaps the biggest hurdle for Australians in researching their family history from Germany, or a German speaking area, is knowing where and how to start. But once you’ve started you often find that the amount of detail that is available in German records exceeds that of comparable English records. It goes without saying that some understanding of the history of the region helps the researcher better understand the lives of their ancestors (the same goes for any region), and this book helps with that. 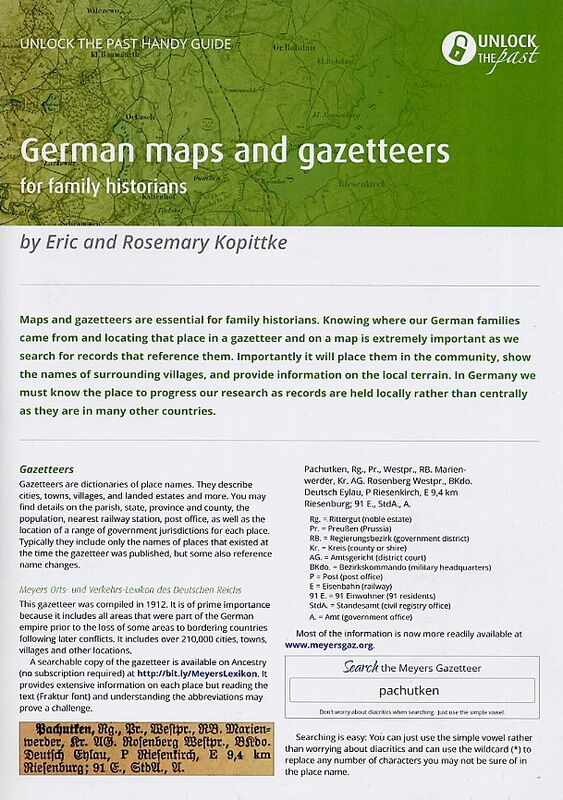 It also takes the reader through the issues surrounding names of people and places that tend to confuse the beginner, and it points to records that can be accessed from within Australia as well as those overseas from Australia that are able to provide the foundation upon which research into our German ancestors can be built. 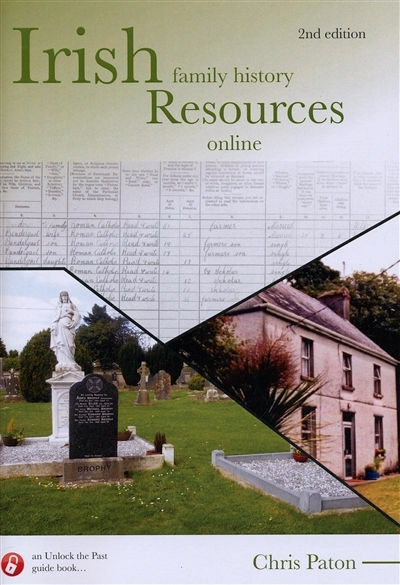 An increasing variety of material, including maps, gazetteers, census records, newspapers, passenger lists and some civil records of birth, marriage and death, and church records of baptisms, marriage burial have been digitised and indexed and are being made available online. This book gives guidance as to how to access these. But it’s not all online by any stretch of the imagination, and the reader is reminded of the value of being part of a family history, genealogy or local history organisation, both locally and overseas. 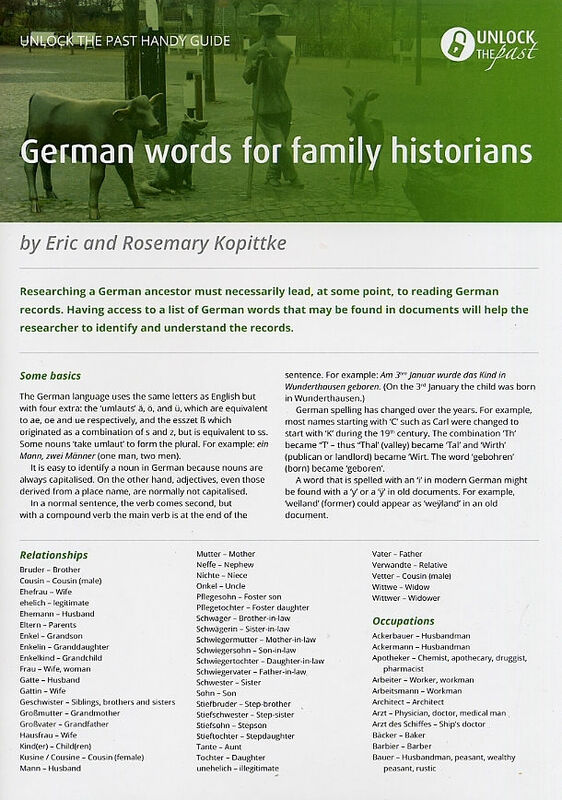 Of course, the German records are written in German, usually in old German script, but a range of tools exist that will help you to make sense of these … and there’s more than like a number of more experienced researchers in local societies who would be happy to help as well. There is a popular belief that Irish family history research is virtually impossible because ‘all the records were burned in the civil war’. But as Northern Irish born family historian Chris Paton demonstrates, the glass is most definitely half full rather than half empty when it comes to research in the Emerald Isle. Many records still exist which can help with your ancestral pursuits, and for those unable to make their way to Ireland to carry out research, the internet is finally coming to the rescue, as more and more material is increasingly finding its way online by the day. 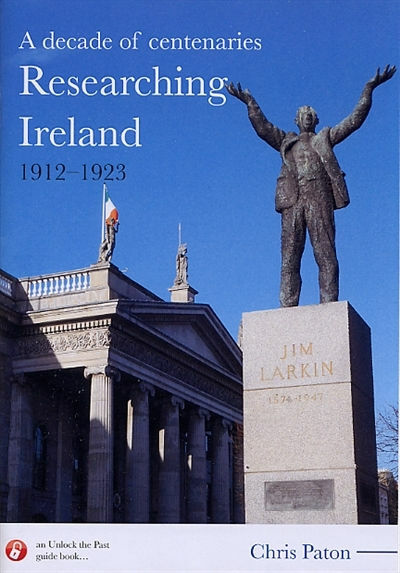 This revised and fully updated Unlock the Past guide explores the key repositories and records now available online, and, will prove to you that if you have been put off with Irish research in the past, now is absolutely the time to take another look. Sooner or later, all genealogists encounter elusive family members: those who appear as if from nowhere; those who disappear without trace and those who vanish for a long period, only to re-emerge later. Ancestors who lurk, parentless, in the top branches of our family tree, or who are apparently still alive at the age of one hundred and sixty are likely to be migrants. This book describes many research paths that you can follow and sources that you can consult, in your quest for that migrant ancestor. If you are successful, you will have found a new piece of the puzzle that is your family’s history. Unfortunately, there is no ‘magic wand’ but adopting a problem-solving approach and following the many suggestions in this book, may help to break down the brick walls that mobile ancestors often leave in their wake. Although it involves work, seeking out migrant ancestors is worthwhile; they often have the most interesting stories to uncover. 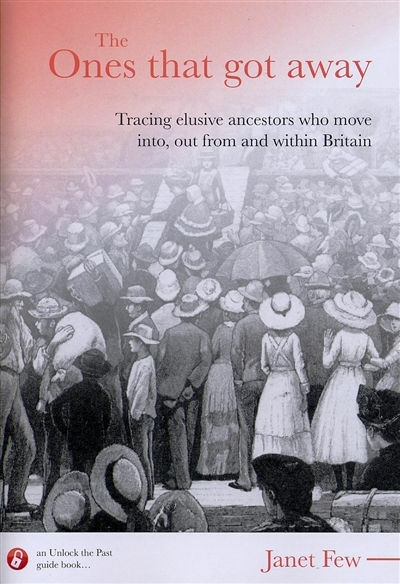 In this volume, you will find advice for locating missing vital records for British family members and advice for those seeking immigrant and emigrant ancestors. There are also lists of useful books and websites for those who need more detail. If, having exhausted all the suggestions in this book, your ancestor remains stubbornly elusive, you can at least be rest assured that you have tried everything that you can to find him. Where do I start? is perhaps one of the most frequently asked questions from people interested in learning more about their family history. The author, Shauna Hicks decided to write this research guide to present together in one place methodology and resources that she mentioned in her presentations to societies and libraries. Using various internet resources, you can usually build a family pedigree quickly, going back several generations. Then you confirm what you discovered and spend more time filling in the details and getting to know your ancestors lives and the communities in which they lived. It is definitely not all online and this guide highlights some of the archives and libraries that you will become familiar with as you research your family history. It is more than a beginner’s guide as it introduces researchers to a wide variety of resources and research methodology. There are many ways to research and record your family history. Even those who have been researching for some time will find new ideas and renewed motivation to seek out seven more information on their ancestors. Family history is a learning process and you will acquire new skills and knowledge as you progress. This book will help to guide you along the way. As the issue of Home Rule reared its head for a third time, its supporters and detractors raised militias to defend their positions, whilst women fought for the vote and labourers fought for better terms from their employers. The First World War would soon dramatically change everything, leading some to see England’s difficulty as Ireland’s opportunity. When an independent republic was proclaimed through force of arms at Easter 1916, the response would see a brutal guerilla war fought between the British forces the Irish republicans, a partitioned island, and a nation divided. A century on, in this book from Unlock the Past, Northern Irish born family historian Chris Paton will help you to discover whether your ancestors were caught up in the events of that period – whether they were Suffragettes, unionised workers, Ulster or Irish Volunteers, fighting with the British Army and Crown forces, against them as rebels and revolutionaries, and in the ensuing civil war on both sides of the Treaty divide. With improved cataloguing by archives, and better access to the records, both online and offline, a new gateway has been opened into one of the island’s most tumultuous, tragic, exciting, and utterly desperate periods of the 20th century. In this book he will show you how to step through it. 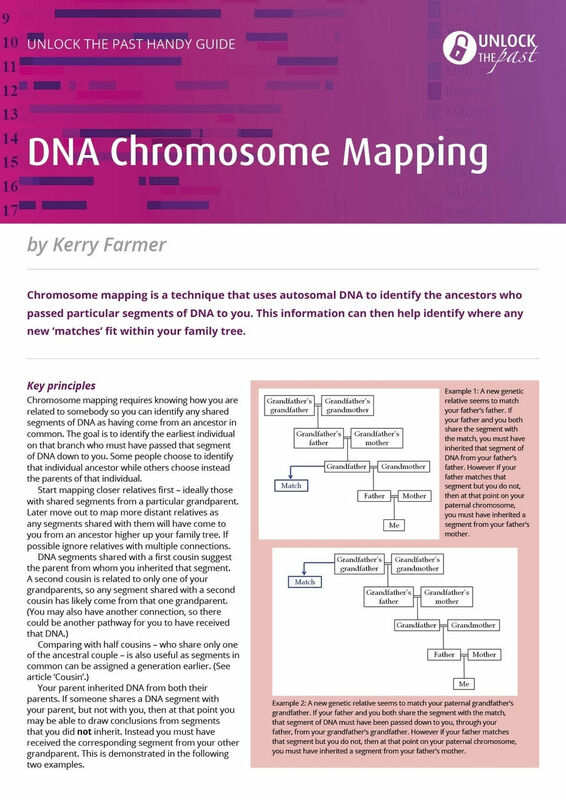 Kitty Cooper’s Chromosome Mapper – receives input from a spreadsheet of shared segment data. Newspapers can tell us much about the lives and times of our families in the past, and provide information not found elsewhere. 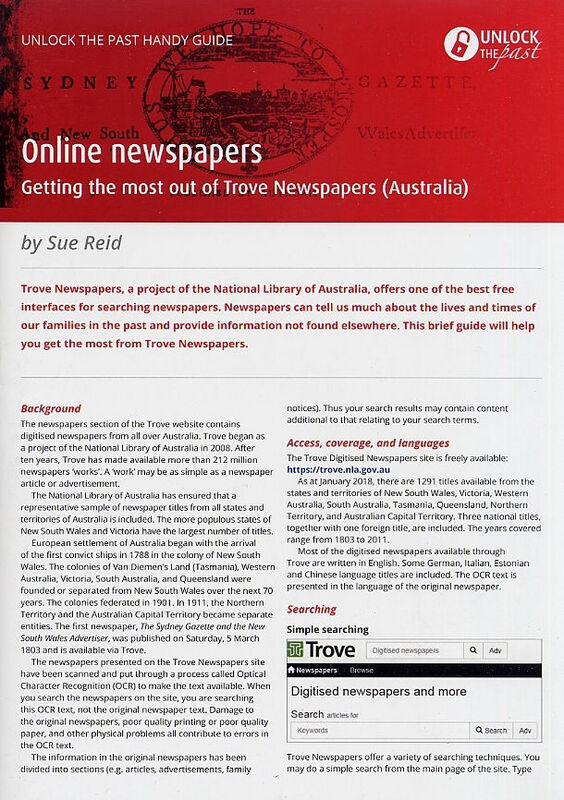 Trove Newspapers, a project of the National Library of Australia, offers one of the best free interfaces for searching newspapers. This brief guide will help you get the most from Trove Newspapers. It begins with a brief background to Trove, then covers the access, coverage and languages. it continues by giving information on how to refine your search, how to use the advanced search or simply browse. Printing, bookmarking, tagging, comments, as well as text correcting, are also covered. Also included are references (and samples) of the “old style” German writing, and you’ll also find links to various websites and suggestions for further reading. Most Australians are pleased to find a convict in the family these days. One who gained a ‘free’ voyage to Australia. Maybe they were an early European settler or a bit of a rebel, but making the best of their adversities. Governments recorded a convict’s trial and sentence, imprisonment, transportation, assignments and punishments until the offender left the convict system by death or freedom – so there is generally more information available about convicts than free settlers of the same period. This Handy Guide gives you a quick overview of convicts to Australia from England, Ireland, Scotland and Wales. 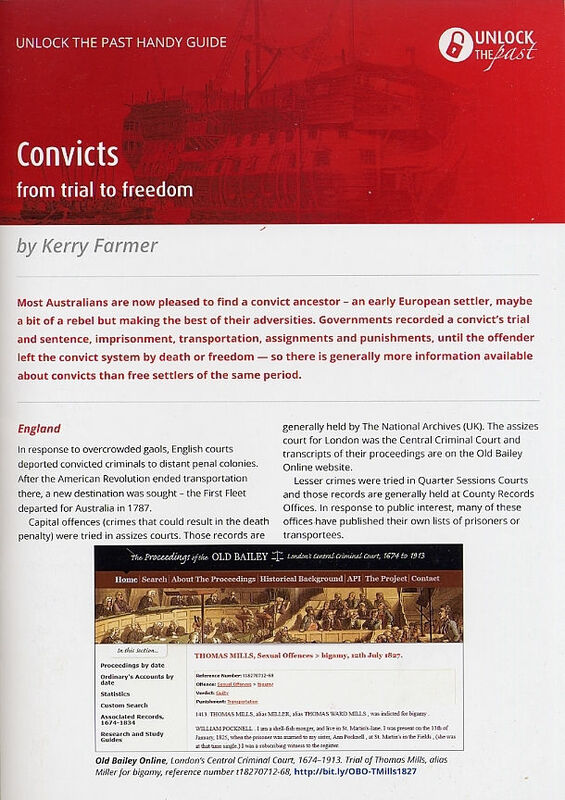 It gives information about what you can find on convicts in newspapers, information on transportation, and the records that you can find on them in Australia. 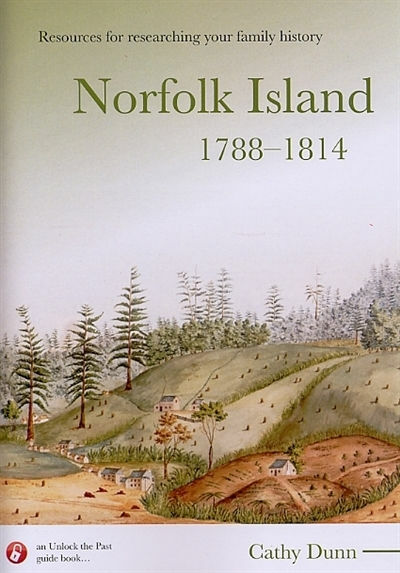 The guide then gives information about convicts in the various Australian colonies: New South Wales, Moreton Bay in Queensland, Norfolk Island, Port Phillip in Victoria, South Australia, Van Diemen’s Land, and Western Australia. It includes plenty of links for you to look further, as well as a list of books for further reading. The question of convicts sent to the Port Phillip District (later known as Victoria) often invokes a statement that no convicts were transported to the district. Although Port Phillip was not one of the mainstream colonies for traditional convict transportation, there were, in fact, six distinct groups of convicts connected to the Port Phillip District: Sullivan’s Bay Settlement, Western Port Settlement; Port Phillip Settlement, Exiles, Convictions, and Free Settlers (former convicts). Make the most of newspapers by using them to help find the details and stories about your family, many of which you can’t find elsewhere. The British Newspaper Archive (BNA) is a subscription service, but a library near you may offer access. 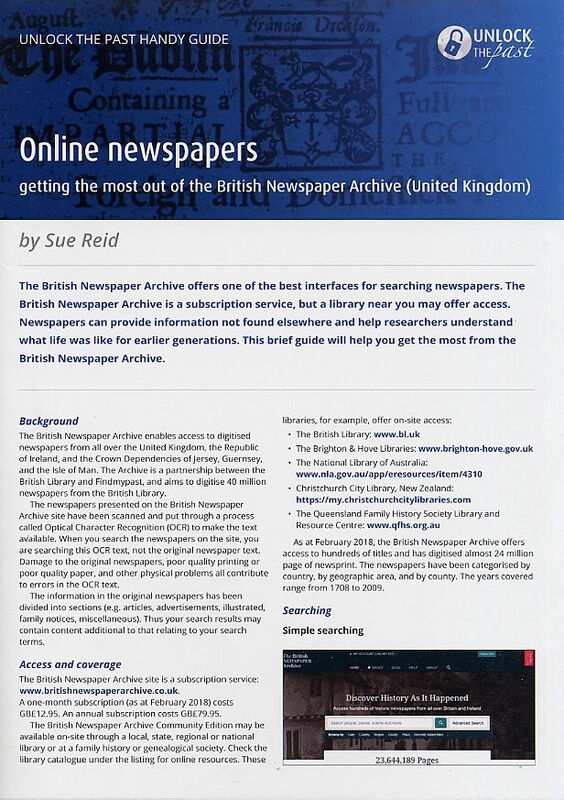 This brief guide gives an overview of what the British Newspaper Archive site offers, and how to use it to advantage. You’ll read about the coverage, how to search and refine your search, advanced searching, bookmarking, tagging, and leaving comments. 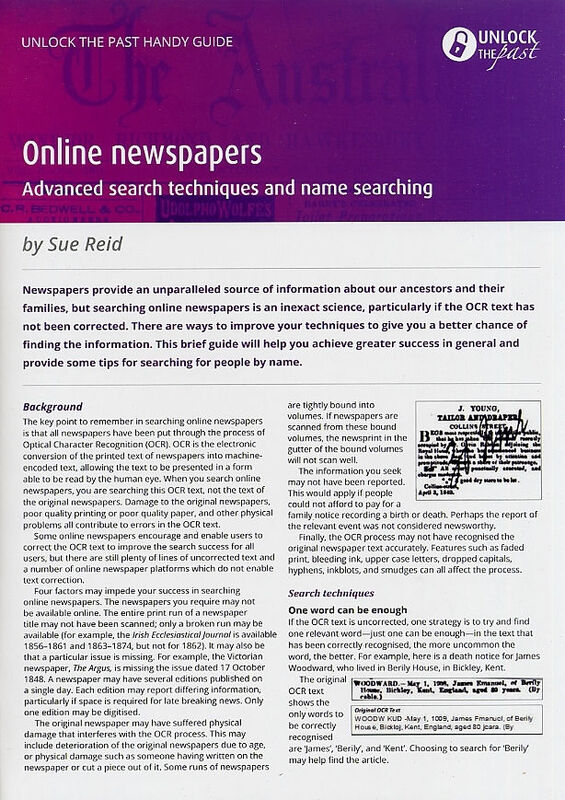 Newspapers provide an unparalleled source of information about our ancestors and their families, but searching online is an inexact science, particularly if the OCR text has not been corrected. There are ways to improve your techniques to give you a better chance of finding information, and this brief guide will help you achieve greater success in general and provide some tips for searching for people by name. The guide covered numerous techniques for searching. Newspapers are an invaluable resource which allows us to extend our research to more than just names and dates, providing a fuller picture of life for people of earlier generations. 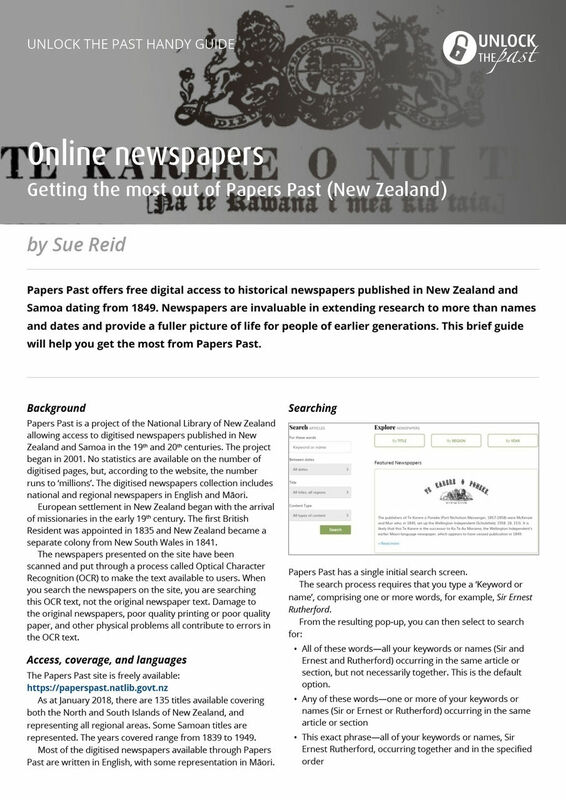 Papers Past offers free digital access to historical newspapers published in New Zealand and Samoa dating from 1849. This brief guide gives an overview of what the Papers Past website offers, and how to use it to advantage. 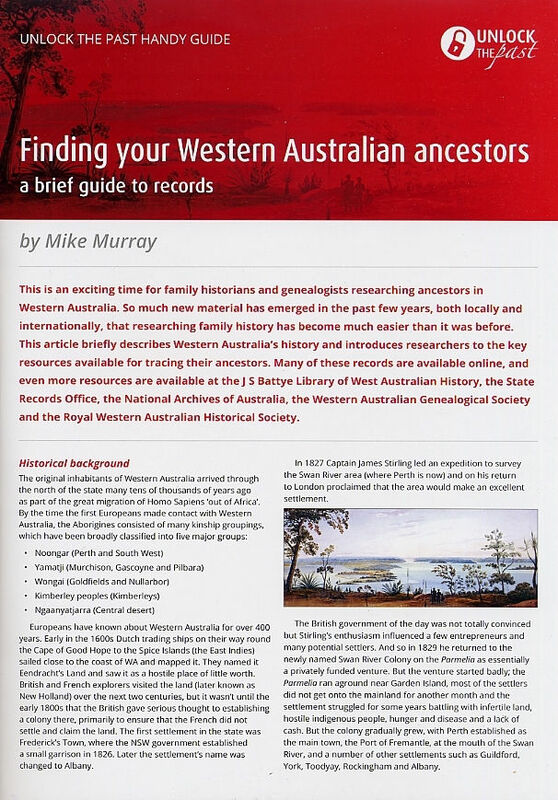 This handy guide briefly describes Western Australia’s history and introduces researchers to the key resources available for tracing their ancestors. Many of these records are available online, and even more resources are available at the J.S. 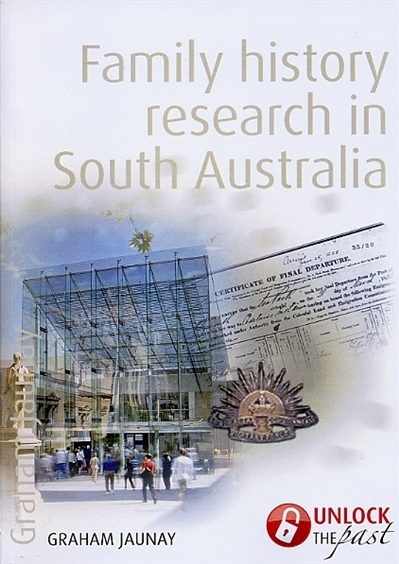 Battye Library of West Australian History, the State Records Office, the National Library of Australia, the Western Australian Genealogical Society and the Royal Western Australian Historical Society.